This recipe makes about 2.5 quarts of finished broth. 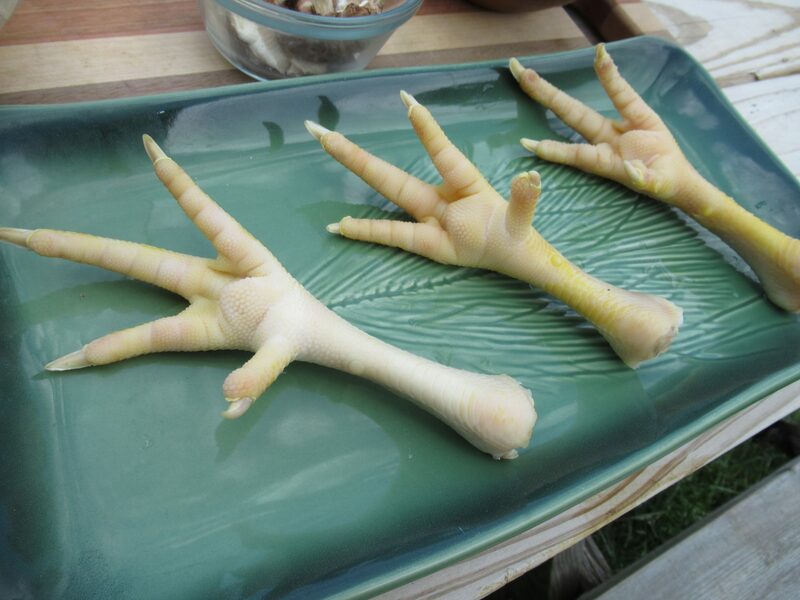 Wash and scrub chicken feet with lukewarm water. 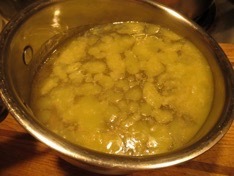 Prepare a pot with about one quart of water on the stove and bring just to a simmer. Add one chicken foot and simmer for 15-20 seconds. Remove from simmering water and plunge into cold ice water. Peel yellow skin from the feet and around the toes. Rinse cleaned feet in cold water and set aside. Repeat with remaining feet until all are cleaned and peeled. 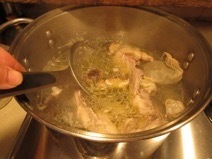 Place chicken backs and cleaned and peeled chicken feet in stock pot, cover with cold water. Add vinegar to the pot and let sit for 30 minutes to one hour. This allows the vinegar to begin extracting gelatin and minerals from the bones and feet. Turn the heat to high and bring water just to a boil and then immediately turn heat down to simmer. Skim any foam that rises to the top of the water. Try to leave the yellow fat but remove the white foam. Add the mushrooms and any dried or fresh herbs. Putting the herbs in a cloth bag makes clean-up easier. Some people prefer to add fresh parsley during the last 20 minutes of simmering because they find overcooked parsley to taste sour. Cover the pot and adjust heat until you can maintain a low simmer. Cooking at too-high heat can cause protein chains to break and can damage the gelationous properties of broth. Simmer for at least 4 hours, but you can go as long as you’d like. When you are done simmering, strain the broth through a sieve or cheesecloth into clean jars and let cool slightly on the counter. Cap the jars and refrigerate or freeze. Leave the fat on the top of the broth. 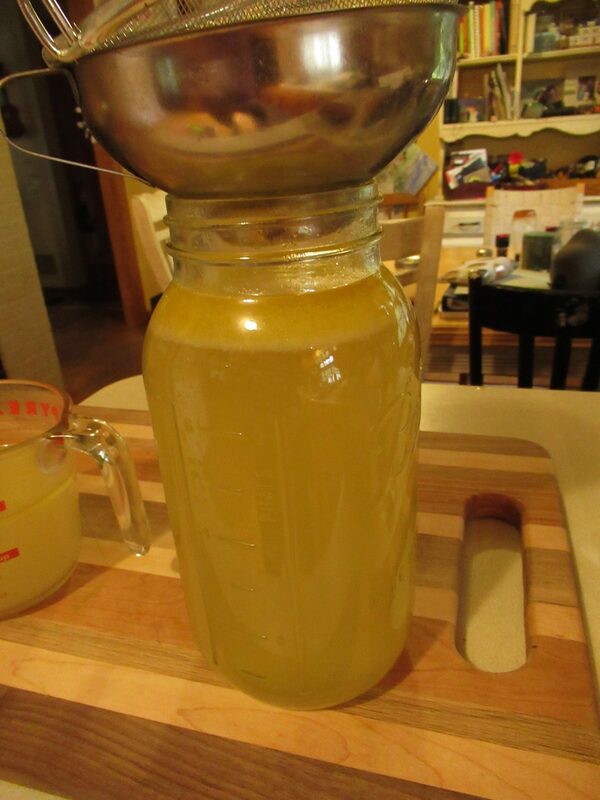 This will form a natural barrier on the broth allowing you to keep it longer in the refrigerator. Alternatively, if you’d like a thicker broth, return the strained broth to the stovetop in a clean stockpot and simmer, uncovered until it reduced to your desired consistency. Many cooks like a thinner broth for drinking and a thicker broth for cooking. 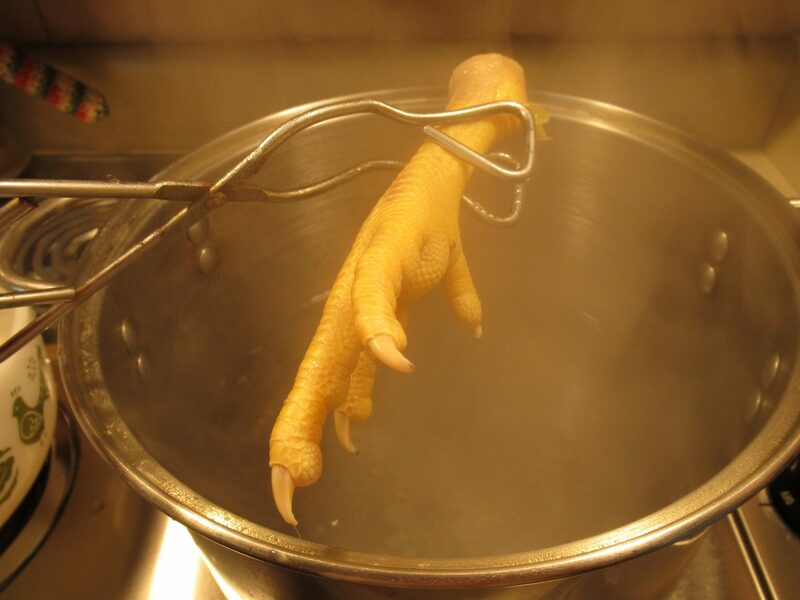 Why add chicken feet to your broth? 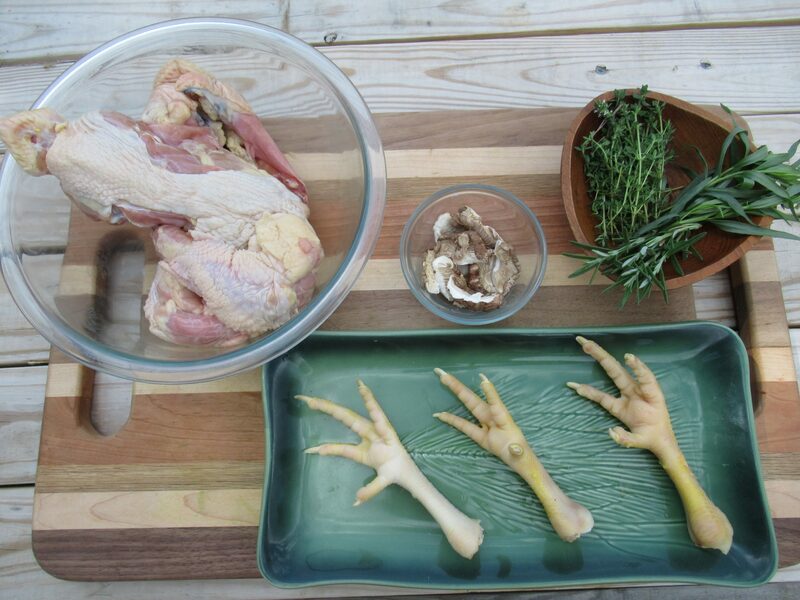 Chicken feet are a great source of gelatin and when added to broth add glucosamine and chondrotin above and beyond what chicken bones contain. Those with an active lifestyle, those suffering from arthritis or other joint issues, and those recovering from joint surgery can all benefit from extra gelatin, chondroitin sulphates and glucosamine in their diet. It takes only about 4 minutes to clean and peel the chicken feet in this recipe. 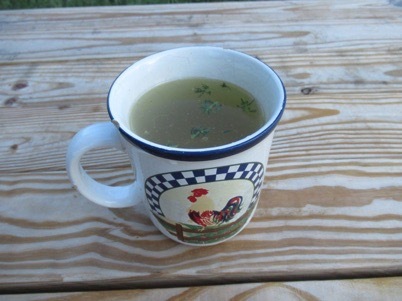 Onions, carrots and celery are common additions to chicken broth. Add these vegetables (and their peels, tops and skins) when you add the herbs and mushrooms from this kit. For a cleaner drinking broth, omit the vegetables. For a richer flavored, darker colored broth you may wish to roast the backbones in a 350 degree F oven for about 30 minutes before adding to the stock pot. You may notice there was no salt in this recipe. Salt to taste before serving the broth.